This page is intended to provide some background information and important links to the Calfire website that has logging plans. Calfire is the agency responsible for regulating logging on non-federal lands in California and their website can be difficult to navigate. Public input is a critical part of the approval process for logging activities in California. Attendance at meetings and submitting public comments can be critical to prevent or delay destructive logging activities. Even if logging cannot be stopped, public scrutiny may result in more sustainable logging practices. In the past, unsustainable logging practices have done tremendous damage to California forests and watercourses. Often the best source of information about the impact of proposed logging comes from people who live close to the forests or watercourses. Each commercial logging project has a plan associated with it, known as a Timber Harvest Plan (THP). These plans may cover a very large acreage, although large plans of this type are rare in Sonoma and Napa. These plans are for a set duration and must comply with an extensive set of state and federal regulations. Another type of logging plan is the Non-Industrial Timber Management Plan (NTMP). These plans cover smaller acreage than THPs although still can be very extensive. They permit logging for much longer period of time without additional public review, sometimes up to 100 years. They are intended for management of forests on land that is not primarily used for timber. The regulations, approval and comment process for both types of plans is similar. Calfire is responsible for both promoting logging in the state and regulating it so is not always rigorous in applying it’s own Forest Practice Rules. That is why public involvement is critical. We must protect our forests ourselves, nobody else is going to do it for us. The dates for reviews and public comments on the website may be incorrect. For example the date by which public comments must be received (End of Public Comment Date) is often earlier than the actual end of public comment date. How do you tell if a plan is of concern to you? Plans will have a name like 1-12-040-SON which means it is in the coastal region (# 1) in 2012 and is the 40th plan of year and is for Sonoma County. Calfire is the state agency that manages logging in the state of California. Most of the material related to logging plans is online, along with comments submitted by the public. This page has a table showing the status of active THPs. This page has a table with THP status but is more readable. The THPs for the entire state are online here. The state has several administrative regions. Finally the THPs are by categorized year. Forest Unlimited is concerned with two Sonoma County on the Gualala River: the “Apple Plan” and the “Dogwood Plan”: The Apple Plan has almost 100 acres of clearcut. 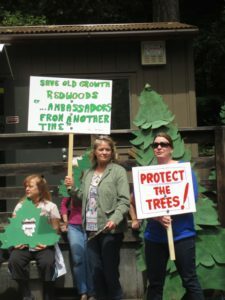 See Current Sonoma Logging Plans for more detail on Apple and Dogwood. The NTMPs are categorized like the THPs, by region and year. Several other organizations track logging and participate in the comment process. The THP Tracking center is an organization that has maps with the plans and comments submitted by the Klamath Forest Alliance which runs the site. There is a searchable map that can be filtered for Sonoma County only.